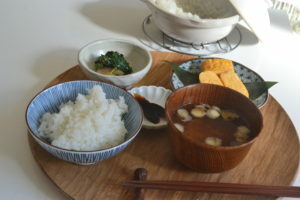 Today, I’m going to show you how to cook traditional Japanese breakfast. Fresh steamed rice and miso soup are the staples to Japanese everyday meal. Japanese rice is a short grain rice. We love its moist amd a little sticky texture. If you can not find Japanese rice, choose sushi rice or California rice. Rinse and clean the rice. Put your rice into a bowl and pour generous amount of water. Stir and pour out cloudy water immediately. 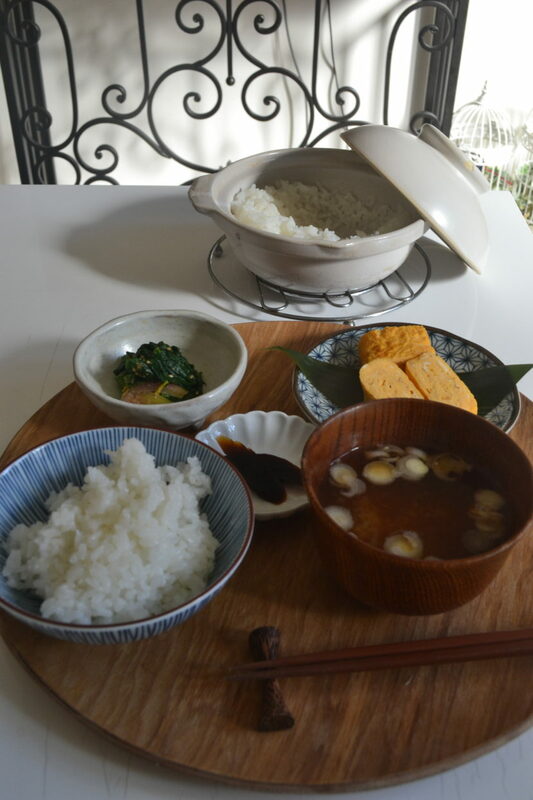 ※The rice is very dry and will absorb cloudy water at this point. So pour out water as quickly as you can. Swish your hand several times to wash. Pour in fresh cold water and pour out quickly. Repeat the process onece again and strain. ※I always strain the rice to attain clear taste. Put rinsed rice into a small earthenware pot or heavy bottom pan. Pour 1.2 cups of water. ※the ratio between rice and water is 1 to 1. If you use a rice cooker, the ratio should be 1 to 1. Put on a medium heat. Give it a good stir when it comes to a boil. Put the lid on and cook for 10 minutes on very low heat. After 10 minutes, fluff with a rice paddle. Serve immediately. Put bonito flakes into a jar and pour boiling water. Let it sit for 5 to 6 minutes. This is the easiest way to make dashi broth. Put wakame seaweed into a bowl and pour generous amount of water. Leave it for 5 to 6 minutes to rehydrate. Cut green onion into thin slices. Sieve dashi into a pot and add miso. Dissolve with using a whisk while heating on low heat. Cut soft tofu into a half inch dice on your palm. Add to a pot. Then add wakame seaweed. When tofu and wakame seaweed heated through, it’s done. Topped with long green onion and serve immediately. There are my son’s breakfast dishes. Side dishes are tamagoyaki Japanese omlete, spinach goma-ae(spinach with sweet sesami dressing) and pickled vege. These are ideal menus to boost our energy! It is so satisfing if I cooked rice perfectly. Give it a try!